The new & improved app, Mad Libs, is now available for iOS 7.0 or higher. What are Mad Libs? They are stories with words left out. Over 120,000,000 Mad Libs books have been sold to date and MadLibs.com gets 50,000 visitors per month. 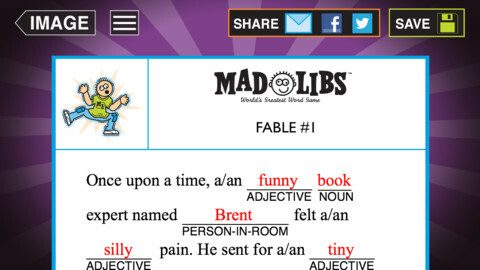 And now, Mad Libs is a FREE educational app for the iPhone/iPad with over 3.7 million downloads. 21 stories are included with this app. Additional stories are available as in-app purchases. Here’s how they work: A “reader” selects a story but he/she doesn’t tell the “writers” (other players) what it is about. Then the “reader” calls out the types of words (adjective, noun, collective noun, verb, ing words, etc.) needed to complete the story. The “writers” generate words to fill in the blanks in the story. Once all the blanks have been filled, the “reader” reads the story aloud. The result is usually a silly story which kids LOVE! And to add to the fun, the upgrade permits you to add photos & images to your story. Mad Libs are a great classroom activity when you have 10 minutes before lunch, you’re waiting for a guest, etc. Kids enjoy playing Mad Libs but in order to play, they have to know parts of speech. Who knew learning parts of speech could be so much fun!?! This would be an awesome app for parts of speech/grammar. It’s free today.